Sam Sevian won the largest Titled Tuesday ever with an impressive 9/10 score. A day earlier, and the numbers would have been suspiciously good, but Titled Tuesday on April 2 was no joke as it set the record for the largest Titled Tuesday ever with 432 titled participants, including Hikaru Nakamura, Alexander Grischuk, Ian Nepomniachtchi, Alireza Firouzja and more. Perhaps we will see a Titled Tuesday break 500 participants this year? As the kids would say, this #TitledTuesday lineup is lit! The event began with some nice tactics as the Bullet Chess Champion qualifier, Firouzja, gave up his queen to conclude round one with a lovely checkmate. These early smashing successes aside, winning such a packed Titled Tuesday is all about amassing a massive score of at least 8.5/10. Stars like Nakamura, Grischuk, and Nepomniachtchi achieved victories in the first several rounds but then dropped some critical full and half-points to their opponents. 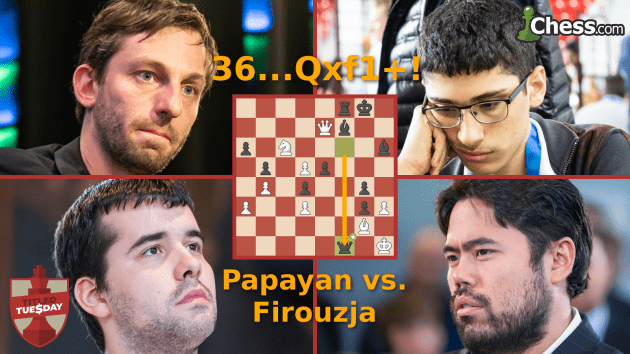 One player who knocked off one of these "big three" was Aryan Tari, who defeated Grischuk in the final round to secure a top-10 finish for himself. The ending mate was quite pleasing. Ultimately, Sam Sevian was the only player to reach a victorious 9/10 points, but his run started quite inauspiciously when he lost in round two after his beautiful attack fell apart. Rh4?? proved a costly step backward when the computer engine Stockfish's Qg4! would have forced mate. However, after that early misstep, Sevian compiled a magnificent eight wins in a row with a series of attacking games. Here is a particularly nice victory where being down the exchange was no problem for Sevian, who eventually broke through on the kingside. For full crosstables and results, go here. GM Aman Hambleton streamed the event on Chess.com immediately after the PRO Chess League semifinals. Sevian won $500 for his clear first-place finish while nine players each received an even $100 for splitting the remaining prize money. These were GMs Gata Kamsky, Haik Martirosyan, Arayan Tari, Ian Nepomniachtchi, Ray Robson, Andrew Tang, and IMs Abdulla Gadimbayli, Vasily Korchmar and CM Vladimir Mikhailovsky. The 2019 U.S. chess champion, Hikaru Nakamura, won the top streamers prize of 20 gifted subs as he garnered a massive audience excited to hear his blitz thoughts.